If you’re ever in Scotland you’ll discover that there is quite a lot to see and do. If you are a fan of history then visiting the historic buildings in the Kingdom of Fife is just the thing to do. It is a lovely region with lots of colorful fishing villages. You will enjoy walking the cobbled streets of Culross which will take you back into the 16th and 17th centuries of Scottish life. This village has interesting historic buildings the Palace and Town House. The Palace has been renovated and there are lovely gardens to stroll in. The Town House offers a great exhibition and there is an amazing tea room which is worth seeing. An amazing village to see and explore is Dunfermline which is the birthplace of Andrew Carnegie and has lots of interesting historic buildings. Carnegie was born here but is associated with the Steel Industry in the U.S. Dunfermline at one time was Scotland’s ancient capital and is the resting place for a lot of Scottish Kings and Queens. Visitors can explore the remains of the Benedictine Abbey which was founded by Queen Margaret in the 11th century. If you wish you can also explore Abbot House and discover all about Dunfermline, Fife and all of Scotland. There is a wonderful garden, a Tea Room and shop. Perhaps seeing St. Margaret’s Cave is more to your preference. This was the cave where Queen Margaret would go to say prayers. It was once on the banks of Tower Burn but now can be reached by more than 80 steps below a car park. You will love to explore Aberdour which is a castle that was built in the 13th century. Visitors love to see the painted ceiling and gallery. The gardens are particularly lovely. For refreshment there’s a cafe. 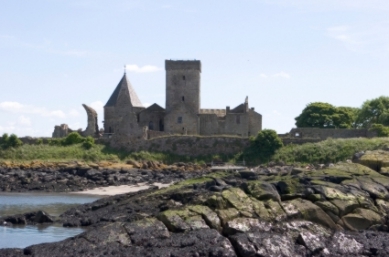 The Inchcolm Abbey is a wonderful place to explore; it’s located on Inchcolm Island. Access to the island is at South Queensferry where visitors can get a boat to the abbey. The Abbey was built in the 13th century and it counts as one of the best preserved monastic historic buildings in Scotland. You can also see wildlife all about. Besides the Abbey there is also a garden, shop and display area. Another delightful place to visit is Falkland and the Falkland Palace. Inside the palace are wonderful tapestries. Outside you can walk about the lovely gardens and see the oldest tennis court in the world. Another wonderful village is Cupar. Just outside of the village is The Hill of Tarvit Mansionhouse which is looked after by the National Trust for Scotland or NTS. Here you can feast your eyes on French, Scottish and Chippendale furniture and fantastic paintings. You’ll love seeing the old kitchen and taking a look at the gardens, shop and tea room. Another colorful and delightful fishing village is Pittenweem. Here you can explore Kellie Castle where you can look at the kitchen and a real Victorian Nursery. If you are interested in ghosts this is just for you since it’s rumored to be haunted. For more interesting adventures there is St. Fillian’s Cave and it is thought that this ancient cave was where the monks used to store their boats. In the 18th century smugglers were caught here. The cave was restored in 1935 and pilgrims still come here. 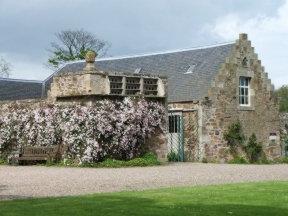 You can take a look at the Fife Folk Museum located in the village of Ceres. Relax in a coffee shop then take a look at the 16th century Scotstarvit Tower. Finally there is St. Andrews. Here you can see the interesting remains of the Cathedral which was once the largest in Scotland and now is home to a medieval sculpture museum. From here you can get a great view of the town of St. Andrews by climbing to the top of St. Rules Tower. Take the time to also visit The Castle which was once the residence of the Bishops and explore the dungeon. There is a visitors’ center where you can get lots of information. These are just some of the great places and historic buildings which you can visit and see in Scotland. So the next time you plan a trip consider the wonderful things you can see and do in this very beautiful country.